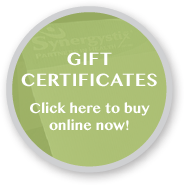 Synergystix, Partners in Health was first established in 1983 under the original business name of The Massage and Hydrotherapy Clinic. From the beginning, as pioneers in the alternative treatment field, we provided massage, fitness training, fitness consultation, natural health care products, and excellent in-house facilities such as a fitness centre. By bringing together a team of therapists and fitness trainers who collaborate and work together to bring you the best in natural health care, we have created a unique health care “synergy” which is holistic in both philosophy and practice. Robert opened the Massage and Hydrotherapy Clinic in 1985. He was the first Registered Massage Therapist in Peterborough, and it was the first clinic of its kind in the province, most likely in the country. At that time when people thought of “massage” their minds turned to the body rub parlours in Toronto; there was no medical or therapeutic mindset back then for massage, and it was quite an adventure to set up shop and set out to educate the public. The Clinic started with Robert sharing office space, then moving to Erskine Avenue and opening his independent business. Before too long he made the move to the larger building at the corner of Rubid and Charlotte (even by then the bank was unsure whether to trust a mortgage to a “massage” business but decided to take a chance) where it grew to a staff of 12, and the Clinic remains at that location today. Robert continued taking courses to expand his knowledge, and shared his knowledge with the community. He held lectures and conducted workshops, taught anatomy and physiology courses at SSFC, hosted a series of interviews on Cable TV, taught for the International Academy of Natural Health Sciences based in Ottawa, and obtained certifications in Orthotaxis, Iridology in Relation to Nutrition, Fitness Training, Addiction Studies, and Colon Hydrotherapy. Through all of this he became aware of the crucial importance of diet and lifestyle habits and how they affect our digestion, circulation and elimination systems and ultimately our overall health. This area of study became his lifelong passion, which led to his studies in California under Dr. Bernard Jensen and Dr. Stirling Alred, both ground-breaking natural health practitioners. The Clinic has evolved over the years, with Jim Smyth coming in as Robert’s partner in the early 90’s and subsequently becoming full owner of the Clinic, now obviously known as Synergystix and offering a diverse combination of treatments to this community. Robert and Jim have continued to work together over the years, with Robert having been still involved (until his recent retirement) with Colonic Irrigation and Lifestyle Consultation. He firmly believes that each of us has the ability to dramatically improve our own health with a combination of useful therapies and wise on – going lifestyle choices. Jim Smyth and Robert Moncrief became business partners and partners in health in the summer of 1991. At that time Jim was studying to become a Registered Massage Therapist at the Canadian College of Massage & Hydrotherapy in Sutton, Ontario, and Robert was operating his massage therapy clinic, on Erskine Avenue, in Peterborough. Robert was looking for a partner, and Jim was looking for a business to buy into and help grow. Jim had come from a computer software background in business, so the combining of forces made sense to both parties. During his software years, Jim experienced migraine headaches and significant low back pain, on a regular basis. As a result he became interested in natural therapy and began considering a career change in the late 80s; consequently, when the opportunity for a vocation change presented itself Jim took the plunge, and has not looked back. By the time Jim graduated and moved to Peterborough in 1992, Robert had negotiated a lease arrangement, with Dr. George Lewis, for the current clinic location at 308 Charlotte. Clinic makeovers were underway, with everyone including Jim taking part in the renovations. In 1995 Robert decided it was time for him to step away from clinic involvement and expand his dream of building a place in the Turks & Caicos Islands, and get involved in other areas of health care. Consequently another negotiation took place and Jim became sole owner of The Massage & Hydrotherapy Clinic. Before leaving Robert took the time to train Irma Tinus to continue to provide Colonic Irrigation for the clinic. And to this day, Jim & Nancy – Robert & June have remained close personal friends. In 1995 Nancy Phillips (Smyth), PFT & Fitness Consultant, also decided to open up the Fitness Facility at 308 Charlotte, which added yet another complimentary health offering. In 1998 Jim determined it was time to change the clinic name so it would better reflect the services being offered. 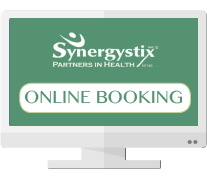 A series of brainstorming sessions were held and the name Synergystix Partners in Health was born. Over the years Jim, like Robert and all the practitioners at Synergystix, has continued to upgrade his skills. He has taken numerous courses in Massage and certified in Neuromuscular Therapy. Jim has managed the Massage Therapy Clinic for Sir Sanford Fleming College, and still sits on the Massage Therapy Advisory council. For a number of years Jim was also very active in the professional association – the RMTOA (Registered Massage Therapists of Ontario). He has worked as a DAC assessor for motor vehicle accident insurance claims (MVAs), and he has written an e-book – Find & Keep Great Associates. Educating people about natural healthcare choices is not as onerous as it was when Robert first opened his clinic; however challenges still remain. And at Synergystix we continue to do our best to educate, incorporate new modalities, and meet challenges head-on. Acupuncture, by Amy Lipsett, is the latest modality to join our grouping of Massage Therapy, Colon Hydrotherapy and Fitness Training. In addition, the Registered Chiropodists, Ian Wilson & Peter Guy, of Peterborough Family Foot-care & Orthotics also share space with us at 308 Charlotte. Continuing to provide a natural health care alternative for the Peterborough community is a passion for all of us here at Synergystix Partners in Health.